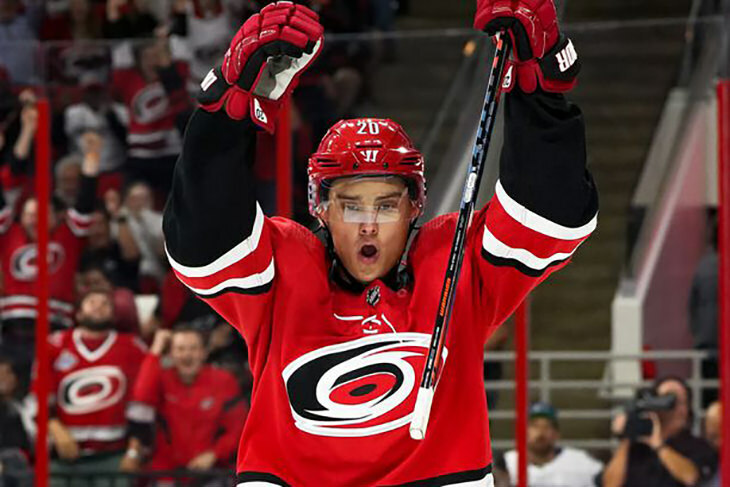 With 4 goals and 7 assists in his first six games, Sebastian Aho has quietly been one of the best players in the NHL, the third round draft pick guiding his team past Badger Bob in Week 2, the Ice Cats earning their first victory of the season. Two points on the final day of the week was enough to turn back the advances of Badger Bob, the Ice Cats improving to 1-1 on the season - the surging team one game back in the Probert division. Badger Bob slumped to 0-2 in defeat and now trail the Grimson division leaders by two full games. Overall the Cats are seated in 7th place, 29.5 rows behind the leader while the Bobs are parked in 10th, 36.6 points back. The Wild Ducks coasted to their second win of the season, the team and their 2-0 record tied for the Grimson division lead. The Misconducts were handed their first loss, the squad dispatched to second place in the Domi division. The Cup-chase standings find the Wild Ducks in 4th place, 10.6 points back; the 8th place Misconducts trail by 34.8. The Central Red Army are now the lone occupant of first place in the Domi division, the third year franchise still perfect after brushing aside the Polar Bears. The Polar Bears stumbled to 0-2 in defeat, two games behind two undefeated Grimson division teams. The big picture finds the Army in 5th place, 20.4 points behind the Vegas Vipers. The Polar Bears continue to occupy the basement, the 12th place squad trailing by 67.8 points. The SC Cobras are showing signs of life but it wasn’t enough to secure a win, GM Murphy’s team still looking for their first "W," an 0-2 record placing the snakes two games back in the Domi. The Bluliners improved to 1-1 with the comprehensive victory, the squad seated in 2nd place in the Probert, one game behind the Ice Hogs. Overall the Bluliners begin Week 3 in 6th place, 20.8 points back while the Cobras remain in 11th place, trailing the best of the FHL by 44.3 points. The Ice Hogs netted more than enough points on Sunday to claim their second victory of the season, the team now sitting alone on top of the Probert division, one game better than the rest. The Boulder Flyers slipped to 1-1 in defeat. Both the Hogs and Flyers are liking their position in the overall standings; the Hogs laying claim to 2nd place, the Flyers seated in 3rd. The Vegas Vipers had no trouble with Concussion Junction, GM Miller’s team improving to 2-0 - tied for the Grimson lead. The Junction are still searching for their first win, the 0-2 squad now two games back in the Domi. Pursuing their first FHL Cup, the Vipers remain camped on top of Mt. FHL, 7.5 points better than the Hogs; the Junction fell to 9th place, 35.2 points behind the league-leading Vipers.